The island of Wyre Lies close to Rousay at the eastern end of the Eynhallow Sound. The island is fairly small, being roughly 3.5 kilometres by 1.5 kilometres, and is largely farmland. Although Wyre is small at only two miles in length, it has two claims to fame. 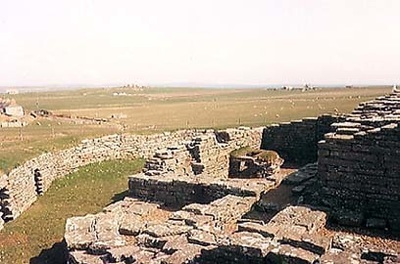 It was the home, in the twelfth century, of an influential and wealthy family, connected to the Orkney Earls through marriage who built a castle here and the head of that family became known as Cubbie Roo. Much later, at the end of the nineteenth century, it would be the home, for some six or seven years, of the poet, Edwin Muir. Cubbie Roo, real name Kobein Hruga, is an historical figure, however, and he is mentioned in the Orkneyinga Saga. He was a notable landowner in Norway before he settled in Wyre and built his castle. His name remains famous although his son, Bjarni, has a much greater claim to fame. He was a poet of note, third bishop of St. Magnus Cathedral and the founder of Kirkwall Grammar School. He endowed a school in Kirkwall with the revenues from Wyre and this continued until a late date. There is some reason to believe that Kolbein Hruga was a tax collector for the Norwegian king. This would explain why he felt it necessary to build such a strong castle. His castle is credited with being the oldest stone castle in Scotland. Being built in Orkney, however, it would have to be built of stone as there is no wood here to build with. Only the foundations now remain but the central tower must have been of a considerable height. It has a well in the centre and would have been able to withstand a siege. And indeed it did withstand a siege. Kolbein’s grandson fled there after committing a murder in Caithness. He was pursued, needless to say, but held out to the extent that the pursuers got fed up and agreed to a truce. They all settled the matter in Norway the following year; the besiegers being a bit cheesed off as only some of the murder squad were executed and Kolbein’s grandson merely got a ticking-off. The castle was described then as ‘being a very unhandy place to attack’. Kolbein’s home was probably at the Bu and it was here, many centuries later, that another poet lived: Edwin Muir. He was born in Deerness but came to Wyre when he was about six and went to school here. The school is now shut and the building has been converted to a Community Centre. His family left Wyre, defeated by the rents demanded by the landlord, and moved to the Mainland of Orkney. A year or so later they moved to Glasgow and the change in lifestyle came as a shock to Edwin. He always fondly remembered his childhood in Wyre. Nowadays Wyre is home to around 20 people mostly involved in farming and tourism. Rousay, Egilsay And Wyre - Main point of reference for Wyre and it's neighbouring islands on the web. Not a great selection of images but plenty of interesting facts for those planning a visit or just interested in the islands history. Undiscovered Scotland - Rousay Ferry - Details on the local ferry that runs between Rousay, Egilsay and Wyre from the excellent Undiscovered Scotland site. 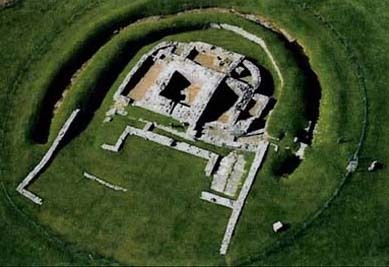 Orkneyjar - Site dedicated to the heritage of the Orkney Islands. This page is all about Cubbie Roo's castle and contains links to other possible pages of interest.